AVLON: Well, the theme of this conference, below the podium and in the seminar rooms, is 'saving freedom,' and that's certainly how the participants view this. They believe themselves to be saving freedom, fighting against socialism...while they can build a bridge to independents on the issue of fiscal conservatism...if you try to extend that and then say it's a fight against socialism, which is the general consensus right now, that seems like a bridge too far. This is a group of people, when they say 'saving freedom,' they're confusing, at heart, losing an election with living under tyranny. That's a message that strikes a lot of independents as a little extreme. Later in the segment, Avlon agreed with Brown after she painted CPAC, and the conservative movement in general, as being primarily about "anger and opposition" in one of her question to Erickson. The regular CNN guest surmised that independents would be turned off by the conservative movement. BROWN: I do want to ask you, Erick, to give me your take, though- because you did hear a lot of anger coming from that podium today, and I do think, at the end of the day, that that alone isn't going to get it. I mean, people are looking for solutions here. They may not like where the President is headed, and they- you know- but you can't just sort of present this opposition position to everything, can you, and have any sort of success over the long term? ERICK ERICKSON: Maybe not over the long term, but, short term- yeah, I think you can and I think they are. I mean, these guys are viewing themselves more as happy warriors, not so much angry- although they don't like the direction the country is going- but they realize that the Republicans are going to pick up seats, just by virtue of history. They're the party out of power. They are really worried more, not just about Barack Obama and the Democrats, but they're worried about what type of Republicans are going to win, which is why you see a guy like Jim DeMint pushing very hard to get conservatives elected in Republican primaries. But they understand what's at stake, and- you know, right up front, I think being the party of no isn't necessarily a bad thing for now, although, when we get closer to the election, they're going to have to not just rally the base, but explain to independents what they would do differently- yeah. AVLON: And the American people want to see problems solved, and if you have a movement that is primarily about anger and opposition, it doesn't cross that bridge. You know, one of the speakers today said, we need to attack, attack, attack, and never defend. Well, the problem with that is, is that they're attacking their fellow Americans, and if you adapt a fundamentally divide-to-conquer strategy- and that's the core of your message- that's going to alienate voters in the center, and it should. You cannot divide-to-conquer the American people at the end of the day. It's a losing strategy, because it's a self-defeating strategy, even if you try to wrap it up in the American flag. ROBERTS: Big change, John, at this year's CPAC conference, is the prominent position that the tea party, the grassroots movement, is playing. 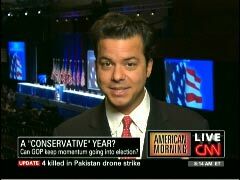 What role do they have there at CPAC this year and what role do you think they're going to have and what influence do you think they'll have in the 2010 mid-term elections? AVLON: Well, here's what's fascinating. One year ago, the tea party movement didn't even exist. The first tea parties were held February 27th of last year, and now, their primary influence at the moment is folks at the podium trying to send the message to tea party leaders, 'We're with you. We want to listen.' So, there's a real shift. They are trying to form a common cause with the tea partiers, and I think obviously, that's one of the reasons they feel they have the wind at their back. But the danger here is at conferences like this, that it's always people talking to themselves. It's conservatives talking to conservatives, and as Candy said, that ends up leaving independents sometimes saying, what is this- a debating society, or is this actually going to perform solutions? Well, they can build bridges on fiscal conservatives and independents, but the consensus here is that what they're really fighting is socialism and fighting for freedom, and that's the ideological message that strikes some independents as being a little far out.